Alan Jackson’s Thursday night (2/23) performance at the San Antonio Stock Show & Rodeo broke the event’s all-time attendance record. He attracted 17,000 fans, the most since the rodeo’s inception in 1950. “The San Antonio Rodeo has welcomed me for a lot of years and it’s one of my favorite places to play,” says Jackson. 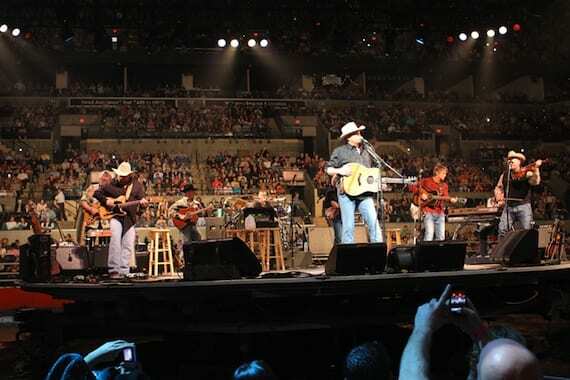 “The rodeo and folks in Texas have always been good to me and I want to thank the fans for coming out to see us all these years.” It was his fifteenth time to play the rodeo, held this year at the AT&T Center. Jackson’s current single, “So You Don’t Have to Love Me Anymore,” is climbing the country radio charts and is from his forthcoming album to be released as a joint venture between ACR (Alan’s Country Records) and EMI Records Nashville. He will perform it on The Tonight Show with Jay Leno on Friday, March 30. The video by award-winning director Steven Goldmann video was shot at Coney Island in New York City and can be viewed here.